Find each other. Stand together. The Dutch version of Unit Victor is live! Unit Victor is available for all Dutch veterans. We are not available yet in other countries. Are you curious to know when this app will be available for you? Sign up for our English newsletter. We respect your privacy and will treat your contact details confidentially. Thank you! From now on, you will receive our newsletter. Did you subscribe by accident? Send an e-mail to info@noworriescompany.com. What is Unit Victor all about? Keep in touch with your comrades. Unit Victor provides a safe, private environment, only for veterans. Find the comrades with whom you have served. Create your own private group chat with your service buddies, in which you can share everything. Become a Buddy-Plus of that comrade who can use a helping hand. 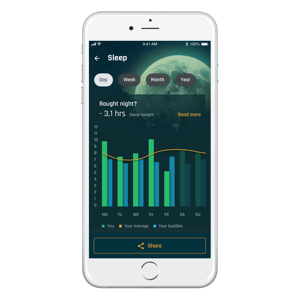 Check your sleep pattern, your mobility and your phone usage in a clear way. These parameters are not random. They can give you more insight into your mental fitness. How (physically) active are you? Which veteran organizations are there? Find all services in your area. To realize this mission, No Worries Company builds digital solutions, tailored to veterans. We believe that the current digital revolution gives the opportunity to reach out to veterans with new, personalised products and services that fill in their hidden needs. That's why No Worries Company uses technological innovations and scientific research to build solutions that fit seamlessly in veteran's daily life. With these digital technologies, No Worries Company bolsters the unique strenght of veterans and their comradeship. This is how the No Worries Company team commits to their mission, being a life full of opportunities for every veteran. No Worries Company always aims for innovative solutions that truly add value to the daily life of veterans. To achieve this, we believe in..
No guts, no glory: in everything we do, we aim to think big, start small and learn fast.